It's easier and cheaper than ever to beam content from desktops, laptops or mobile devices to an HDTV, which is what makes Microsoft's new entry into the space something of a head-scratcher. Microsoft announced pre-order availability for the clumsily named Wireless Display Adapter, which appears to be Redmond's take on Chromecast. It is, however, limited to Miracast-enabled devices such as Windows 8.1 PCs and tablets. Priced at $59.95 (about UK£37, AU$68), the dongle is nearly twice the cost of Google's own solution, and a tad more cumbersome, thanks to a longer, more squarish design with a built-in USB cable protruding from the opposite end. 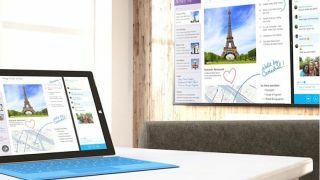 On the plus side, the Microsoft Wireless Display Adapter isn't limited to compatible apps, and can be used to either mirror a device screen or even extend it onto any HDMI-equipped display. One unique feature of the Wireless Display Adapter is its ability to project the screen from a Windows Phone 8.1 device such as the Nokia Lumia 1520 to the big screen, although Microsoft pointed out that the dongle wasn't limited to just one platform. Although Apple's iOS devices are left out of the party, Miracast-supported Android devices can also get in on the action, great for catching up on favorite TV shows while at a hotel room or checking out photos from the family vacation while you're still on it. With the higher price tag, Microsoft appears to be focusing sales of the Wireless Display Adapter to enterprise customers, although the dongle will be offered at Best Buy retail locations in addition to the Microsoft website or brick-and-mortar stores. The Microsoft Wireless Display Adapter is now available online from the Microsoft Store or BestBuy.com, and is expected to become "generally available" in October. Take in our exhaustive review of the Nokia Lumia 530 smartphone!